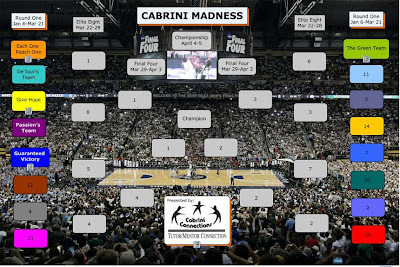 In anticipation of college basketball tournament season, Cabrini Connections is starting its own tournament. Each team consists of volunteers, students, staff, etc. and will compete to raise the most money before the championship game on April 5th. 13 teams have already formed to compete on our GiveForward online fundraising page. Once the Division I Men's Basketball Tournament starts in March, we will make our cuts at the same times they do. Our top eight will advance after the Sweet 16 round; our top four will advance after the Elite 8 round; our top two will advance after the Final Four; and our top fundraising team will be chosen at midnight on the night of the National Championship Game. A few weeks ago, I was recruited by veteran volunteer Charlie Megan to join "The Green Team" - helping raise green for Cabrini Green. We had our first team meeting last night and, as you can see above, we have a pretty deep roster. You can see our full roster, logo, and team description on our GiveForward page. I would appreciate your support as we try to take the title and raise some much-needed funds for Cabrini Connections. If 20 people who read this each donate $5, there's $100 right there! Every little bit helps. Thanks so much! The 2009-2010 Youth Leadership Council held its fourth meeting on Monday, January 25th. Providence St. Mel 9th grader Mylana Williams (above) was introduced as the council's newest member. She replaces Victoria Rivera whose schedule does not allow her to participate at this time. We welcome Mylana and look forward to incorporating her perspective into a new year of YLC initiatives. As opposed to its usual external focus, this meeting was very introspective. I asked the students to define leadership. "What qualities and characteristics do you look for in a leader?" I prepared a list of what I thought to be good answers, and they just blew me out of the water! Not only did they cover all of my suggestions, they had plenty more! According to YLC, good leaders set goals, show respect, stay on task, listen, are strong & bold, take criticism, practice what they preach, are willing to follow, and the list goes on. Now that I've recorded their excellent answers, they are going to hold each other accountable for them. If they are leaders in our program, they should be exhibiting these qualities and characteristics all the time. We have members who are outgoing, enthusiastic, talkative, friendly, hardworking, motivated, athletic, helpful, and nice to be around. We have members who are good at acting, singing, writing, dancing, drawing, speaking, and with computers. We have members who work at Jewel-Osco, are on Region 2 Youth Leadership Council, are in Tech Club, and go to CME Church. As you can see, we have a dynamic group of young people on Youth Leadership Council. At their next meeting, members will discuss how these assets are connected and how they might leverage them as a group. I think asset mapping will be very helpful in facilitating their brainstorming. Stay tuned for their reports next month. Thanks for keeping up! 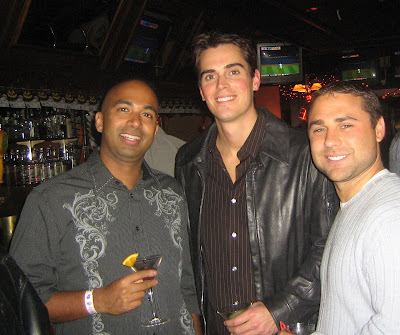 Anupam “Nupe” Basu (left, pictured at Martini Madness) grew up in Naperville, Illinois, and has lived in the Chicago area since he was five years old. He received an undergraduate degree in biology from University of Illinois at Urbana-Champaign and he went to medical school at Loyola University Chicago. He now works as a radiologist at Cook County Hospital. Radiologists read any kind of imaging study that comes in, from a gunshot wound to an athlete with knee pain. Imaging technologies like x-ray get to the bottom of medical issues. “It’s sort of like detective work,” says Nupe. “You take a patient’s history with their past experiences and a physical exam and you figure out what’s going on.” Nupe says he’s always been science oriented. Math and science are culturally valued in his family. Rather than follow in his dad’s footsteps as an engineer, Nupe chose to study medicine because of its direct service element. “I’m a people person,” says Nupe. “I love chatting and talking to people.” Now he gets to work directly with clients. He even got to treat some Chicago Bears football players last year as part of a one-year fellowship at Evanston Hospital. He helped diagnose shoulder, knee, and hip injuries, among other things. Nupe is a huge sports fan. His favorite teams are the Cubs and U. of I. basketball and football. 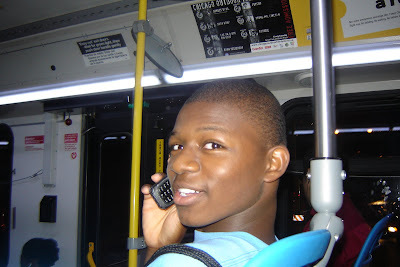 In the coming years, Nupe plans to get a master’s degree in business administration. He sees change coming to his field and he wants to be ready for it. “Doctors are sort of taken advantage of,” he says. “They have very little exposure to the business side of things.” His decision could prove very wise given that health care is a multi billion-dollar industry. No matter what, though, Nupe will stay in the Chicago area. “I love the city,” he says. “I’m like a walking ad for Chicago.” His favorite place is Burnham Harbor, right between Adler Planetarium and Shedd Aquarium, because it offers a great view of the city. His favorite activity is the architectural boat tour on the Chicago River. Nupe heard about Cabrini Connections through Writing Club Coordinator Shannyn Nellett. He works with first year student Cantrell Strauther on Thursday nights. “It’s been a very educational experience,” he says. “It’s cool to see the passion in the room.” Nupe has a deep appreciation for opportunities he’s been given in life and this is one way he likes to give back. He is well suited for the role of mentor because he is the oldest of three children. “I’ve led my life trying to be a role model,” says Nupe, “and, in trying to set an example, I live better. … You can learn as much from being a mentor as a mentee.” That is a great lesson learned. Thanks for joining us, Nupe! 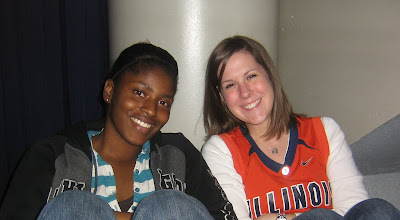 Megan Caradine is from the west side of Chicago and is a senior at Al Raby High School. She plays several sports including volleyball, basketball, track, and tennis. Amazingly, Megan is able to get great grades despite being so busy. Her coaches make sure work comes first and players always go to study hall right after practice. Megan’s family has always been good at math and science, which are her favorite subjects in school, too. Megan is an only child and her grandmother and four uncles are very influential in her life. This week, Megan is in the spotlight because of her decision to attend Allen University in South Carolina. Congratulations, Megan! “Allen University opened its doors in 1870 to provide educational opportunities for newly freed slaves,” says the school’s president. Today it is listed as a Historically Black University whose core values are integrity, accountability, respect, excellence, and faith. “Allen University is a Christian Liberal Arts institution whose purpose is to prepare leaders who are skilled in communication, critical thinking, and who demonstrate high moral character,” says the school’s web site. “Our aim is to provide an environment of academic excellence in order to heighten our student’s chances of succeeding in a culturally diverse and economically global world.” Allen sounds like a wonderful school! Megan will study biology and live on-campus with her friend and fellow Cabrini Connections Senior Diamond Clark-McQueen. She looks forward to meeting new people and finally getting to see what college is like (after hearing a lot about it at school and in our College Zone). Megan’s goal is to become a dentist and open her own office in her community on the west side. At Cabrini Connections, Megan works with first year mentor Liz Sablich. Liz is “cool,” “down to earth,” and “always there,” says Megan. “She’s just a phone call away.” Right now, Megan and Liz are searching for and working on scholarships for college, so if you know of any, please let them know. In her spare time, Megan likes to work on computers. She can tear them apart and put them back together with ease. She also likes doing her friends’ hair. Megan has a good group of friends who motivate her. She says it is important to keep close friends around to guide you. “My goal is to live happy and make sure I compete in life,” says Megan. You’re doing well so far. Congratulations on your successes and good luck in college! January is National Mentoring Month and today is Thank Your Mentor Day! Watch Cabrini Connections students thank their mentors in the video above. I hope you will take time out of your day to thank mentors in your life, and, please, consider being a mentor yourself. You can find a list of Chicago-area programs here. Thank you! 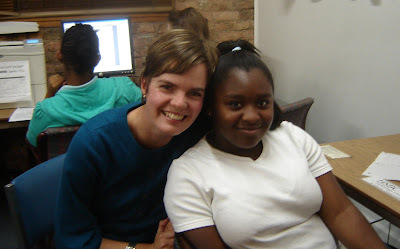 Cathrine works with 8th grader Ayana Martin on Wednesday nights. They started our program in a 2-on-2 match with Cathrine's friend, Cassia Overk, and Ayana's friend, Ana Tate. Cathrine says 2-on-2 is a great way to start, get to know each other, and make things fun, but, after awhile, once you can better discern each student's strengths and weaknesses, working style, etc., it's best to work apart. However, the support will always remain. Ana, who joined Cabrini Connections a year before Ayana, helps Ayana feel comfortable at tutoring sessions, while Cassia helps Cathrine understand the dos and don'ts of mentoring a teenager. Cathrine's #1 tip from her early weeks with Ayana: "you have to be yourself all the time." Cathine is from Denmark, a Scandinavian country in Northern Europe. Its people are frequently rated as the happiest in the world. All education is free up to a master's degree, and, at one point, Cathrine even got paid to go to school! With the addition of a part-time job, she was able to avoid student loans while living a moderate life. Cathrine studied information technology in school and was an IT consultant in Denmark. IT consultants work with different companies who don't like their IT systems. Consultants show options for a new system and a new way of working. Their job is to get everyone on board and provide continued support. This line of work is rewarding for Cathrine because "you come in three months later and see people happier and into their jobs." Two years ago, Cathrine moved to Chicago after receiving a green card through the United States' Diversity Lottery. A section of the Immigration and Nationality Act provides a maximum of 55,000 Diversity Visas each fiscal year to be made available to persons from countries with low rates of immigration to the U.S. Cathrine won in her third year. Cathrine works as an administrative assistant now and lives in Lincoln Park. She likes Chicago because of its proximity to Lake Michigan. She is somewhat of an outdoor person, especially when it comes to water. Cathrine is a qualified Divemaster (a diver who takes care of a group of divers). Cathrine doesn't have any New Year's resolutions because, "I try to correct a little earlier." She does, however, offer some great advice: "If you work hard, you can be whatever you want to be, but you have to work on it a little every day." I think that's a great perspective to pass on to kids at Cabrini Connections. Thanks for joining our program, Cathrine! We're happy to have you. Ruben Salazar 8th grader Ayana Martin loves science - especially when she gets to dissect animals. She recently worked on rats to explore how they are similar to humans. An interest fact that Ayana has to share: the small intestine is actually longer than the large intestine. It gets its name from its smaller diameter. Ayana also loves basketball. Her favorite team is the Chicago Bulls and her favorite players are Point Guard Derrick Rose and Center-Forward Joakim Noah. Ayana learned about what it's like to be on a team last year when she played center for her school's team. "Teammates don't talk to you as much as you think they would," she says. "You have to know each other." She makes a great observation. Often times the best teams have players who know each so well, that, on the court, it's as if they know what each other is thinking. Ayana lives in Westhaven Park in the Near West Side neighborhood of Chicago. She has liked growing up in the city, but eventually she wants to move to a more rural area. Actually, she wants to move to Iowa (a very rural area). When I ask her why, she says, "It's quiet and there's not much to do." It appears Ayana is a very simple girl. I guess that's why her mother nicknamed her "Plain Jane." Before settling in wide-open spaces, Ayana has big plans for her education. For high school, she would like to attend UIC College Prep, the LSV campus of Noble Street Charter School, and, in college, she would like to study veterinary medicine. "I love animals and learning new things about them," she says. Maybe one day she will save the life of her favorite animal - the panda. We look forward to seeing Ayana around Cabrini Connections for the next few years. She and her mentor, Cathrine Lynnerup, have been an asset to the program and we wish them the best! On January 18, 2010, Cabrini Connections students volunteered with City Year Chicago at a school on the south side in honor of Martin Luther King, Jr. Day. 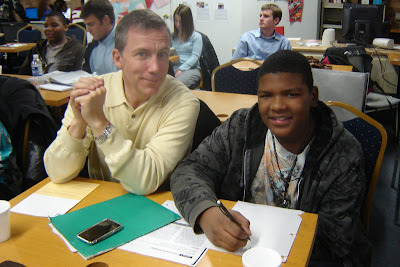 They painted several classrooms and were treated to a visit from Richard M. Daley, Mayor of Chicago. We are very proud of our students and we hope you enjoy the video! 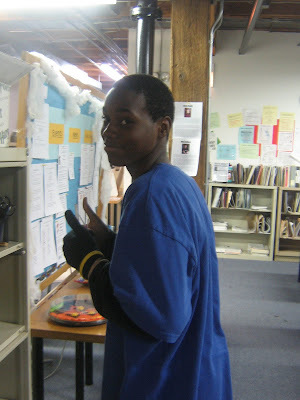 13-year old De'Jour Stewart was born in Chicago and lives in the Cabrini Green neighborhood. He is in 7th grade and he is on the Honor Roll at Jenner Elementary Academy of the Arts. His favorite subjects in school are math and social studies. Math was hard at first, but he enjoys inequalities and graphing, which he is working on now. Social studies comes easy to him because he watches a lot of History Channel programs and he has a good teacher. His most difficult subject is reading, but he is trying to get better by focusing on the whole subject and not getting off track (i.e. though individual assignments may seem laborious, as a whole, the work will pay off in the end). De'Jour's big project at school is a talent club called Friday Crew. Now in its 10th year, Friday Crew is initiated by a mentor from Columbia College who introduces a project and provides further instruction. De'Jour and his friend Miles are the student leaders of the program. They are in charge of recruiting members, keeping attendance, removing people if necessary, and other administrative tasks. At a recent audition, 24 students showed up and 13 were chosen to join the Crew. Members are talented in singing, dancing, and/or rapping, and their final project is to make a group video. De'Jour also co-hosts a program on his school's TV network called the Mac-N-Cheese Show. He creatively reminds students of rules; he talks about the future, including upcoming events; and he shares talent from Friday Crew (e.g a singer performs). De'Jour loves to make beats. His dream job is to be a music producer. Last year, when he graduated from 6th grade, he got music production software called FruityLoops. He has since upgraded several times, each time allowing him access to more sounds and effects. His favorite producers are Timbaland, Kanye West, and Swizz Beatz, and, like any natural talent, De'Jour says the beats "just come out of my head." Of Cabrini Connections, De'Jour simply says, "I love it." He says his mentor, Matt Barnes (pictured above), is "a person who really cares" and that it helped to meet him before tutoring began in the fall. (When matches are made over the summer, we encourage them to meet at least once before school starts to get to know each other.) De'Jour's biggest goal right now is to get his grades up, and his biggest dream is "to be known." Well, De'Jour, you're already well known around Cabrini Connections. Now we just need to make sure the rest of the world is ready for you! Congratulations on being in the spotlight! ... and Happy National Mentoring Month! Watch videos of celebrities such as Quincy Jones, Sting, Cal Ripken, Jr., talk about the mentors in their lives. Go to YouTube on Thank Your Mentor Day (January 21st) and make the National Mentoring Month videos the most popular of the day! Please share the message of mentoring with your friends and family and consider getting involved as a volunteer and/or donor in 2010. You can make a difference! Thank you!